The witchhazel leaf gall aphid, Hormaphis hamamelidis, is most often noticed as the "aleurodiform" (whitefly form) on birch leaves in late summer or fall. In late summer, these whitefly-like aphids give birth to nymphs that develop wings. These winged aphids fly back to witchhazel and give birth to a generation of wingless females and males that mature and lay the overwintering eggs. 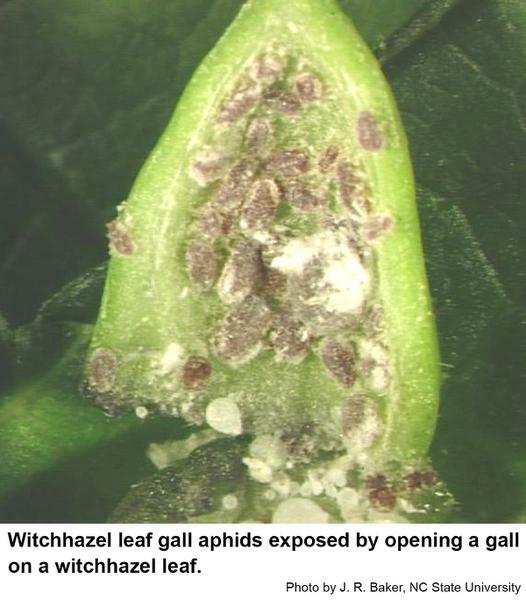 In the next spring, the overwintering eggs hatch and the young aphids induce witchhazel to develop leaf galls inside of which the aphids grow and reproduce. The galls are cone-shaped so these aphids are sometimes called, "witchhazel cone gall aphids." 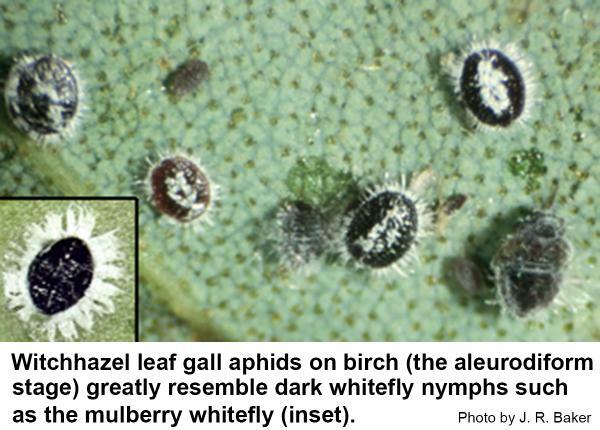 In late spring or early summer, the new aphids emerge from the galls and fly to birch where their offspring feed on the leaves as a stage that more closely resembles a scale insect or a mulberry whitefly nymph (the "aleurodiform") than an aphid. The alternation of hosts is well known for other aphids (woolly apple aphid: apple and elm; woolly alder aphid: maple and alder; green peach aphid: peach and many other hosts). A conical leaf gall opened to show the witchhazel leaf gall aphids inside. The aleurodiform of the witchhazel leaf gall aphid on birch. Witchhazel leaf gall aphids cause conical galls on the leaves of witchhazel. Sooty molds do not seem to be associated with this stage. On birch, the aleurodiform stage excretes honeydew in which sooty molds can grow to further disfigure the birch foliage. Insecticidal soap, Orthene or one of the other contact insecticides should give adequate control of the aphid on birch. Consider using one of the horticultural oils as oils are reputed to remove sooty molds more rapidly than other pesticides. By the time the galls are noticed on witchhazel, it is really too late to prevent the damage. Orthene applied just at bud break should control the galls next year. American Witchhazel (Hamamelis virginiana L.). Stritch, L. No Date. United States Department of Agriculture Forest Service Plant of the Week. Galls on trees. Anonymous. No Date. Missouri Botanical Garden. Which witch hazel should be in your yard? Zaworski, K. 2013. Smart Gardener, Chicago Botanic Garden. Witch-hazel cone gall aphid. Anonymous. 2013. Wikipedia, The Free Encyclopedia.